HIGHLANDS  After 8 years of posting on the National Priorities List of Superfund sites, the EPA will finally announce the details of their Proposed Plan for dealing with the toxic wastes in the storage pits in the San Jacinto River. Officials from the Dallas office of the EPA, or federal Environmental Protection Agency, will be on hand at a meeting on Thursday evening, Oct. 20 at 6:30 p.m. in the Highlands Community Center building. The press announcement released last month stated that they had determined that all toxic waste, which is deadly diozins and furans, should be removed from the north and south impoundments which straddle the I-10 bridge over the San Jacinto River. The Superfund Process is a slow and methodical step by step regulations that end up with a Record of Decision which will be announced by the EPA at the end of December. Theoretically this will end the study process, and allow negotiations and removal work to proceed. However, We are now entering a 60 day public comment period, which will end on November 28. The public is urged to express their views on the problem and the proposed solution, at this meeting or directly to the EPA on their website or by email. Each comment will be answered, according to EPA, and entered into the public record. It is possible, but not likely, that the Proposed Plan could change after this process. Jackie Young, the most vocal of the proponents that want the toxic wastes removed, has called for the public to attend this meeting, and then submit their comments or opinions supporting the complete removal. Young claims that opponents have been circulating false and misleading information regarding the clean-up process. The EPA said that Thursdays meeting is to inform residents of the proposed cleanup strategy and obtain comments on the Proposed Plan and EPAs preferred remedy. If you are unable to attend, or do not submit comments at the meeting, you can still send your opinion to the EPA before November 28. 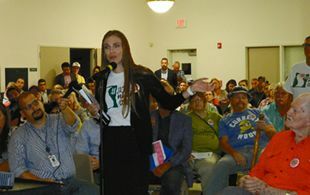 A group of opponents to the clean-up, known as San Jacinto Citizens Against Pollution, with the website keepitcapped.com have just issued another position paper, from an environmental expert. Dr. Tim Barber, who works for the Environmental Resource Management firm, a private consulting company, has stated in a press release that perhaps the most significant issue associated with dredgings potential effectiveness is the extent of residual contamination following dreding. No dredging operation can remove every particle of contaminated sediment, and field results to date for completed environmental dredging projects suggest that post-dredging residual levels, expressed as contaminant concentration in surface sediments, have often been greater than the cleanup levels. HIGHLANDSFrom Camp Pendelton in California Drew Greer was looking forward to a relaxing homecoming to his Grace Lane residence, but his family and community had another idea, a welcome worthy of the dedication and service he had completed as a Marine. 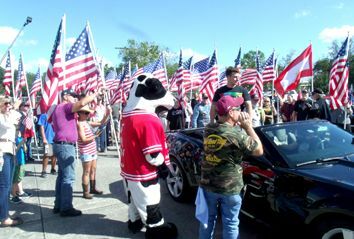 After being joined by the Chick-Fil-A Cow in his mothers convertible a procession went north to his residence where more ceremonies commenced. Initially, old stories of Drew before his service were told to rib him and show their notice. The kids bestowed small cows to him from Chick-Fil-A as an honoring. Some of his experiences during the service were relayed, he learned to cook an iguana lizard for example. The number for the Hamiltons is (832) 385-3070. HIGHLANDS  The Highlands Horizons club held their 24th annual Miss Highlands pageant last Saturday night at the Highlands Middle School. Earlier in the day they held the Jr. Miss pageant at the same location. Emcee for the program was Baytown assistant police chief David Alford. The theme this year was a Western motif, with a tribute to the Lone Star State. Both pageants included an opening number, contestant introductions, casualwear modeling, talent competition, dress modeling, and interview questions. 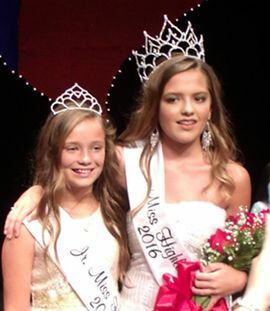 The judges picked Hannah Lee as 2016 Miss Highlands, and Anna Keyes at Jr. Miss Highlands. The first runner up for Miss Highlands was McKenzie Rezneciek, and the second runner up was Victoria Gonzales. Haley Maxey won for High Ticket Sales, Hannah Courtney for Congeniality. Cydni Selensky was Most Photogenic, and Anna Keyes for Talent. Hannah Lee was chosen Jr. Miss Highlands, and also won for Talent. The Congeniality winner was Kennah Holloway, Peyton Orwell won for Most Photogenic, Olivia Banks for High Ticket Sales. Proceeds from the pageants are used to give scholarships to graduates from the community, and to help needy families and students. This year the Horizons gave 10 scholarships to deserving graduates. Each year the Horizons present the Jennie Robbins Community Service Award to the Miss Highlands contestant who has proven to be community minded and dedicated her time to serving and helping others. This year the award was given to Victoria Gonzalez.